Get notified when Miranda Sings tickets are available! Miranda Sings is a fictional character played by YouTube personality, comedian and actress Colleen Ballinger. Miranda Sings was created in 2008 online and is represented as a misguided, talentless and egotistical woman, used as satire to comment on the state of social media stardom. Miranda has guest-starred with notable talents like Jerry Seinfeld and has been on The Tonight Show Starring Jimmy Fallon. Currently, she is the main character of the Netflix original show Haters Back Off and Ballinger and has taken home both a Teen Choice and a Streamy Award for her Miranda Sings videos. 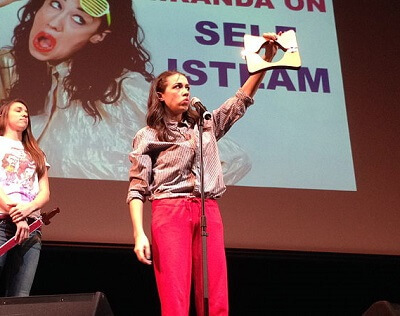 Be in her live audience by buying Miranda Sings tickets with the links above.